A couple of weeks ago Mr W and I ventured out to try Spikes Bistro for our evening meal. It was a perfect setting, looking across the beautiful golf course, and with air-conditioning as a bonus to keep us cool. 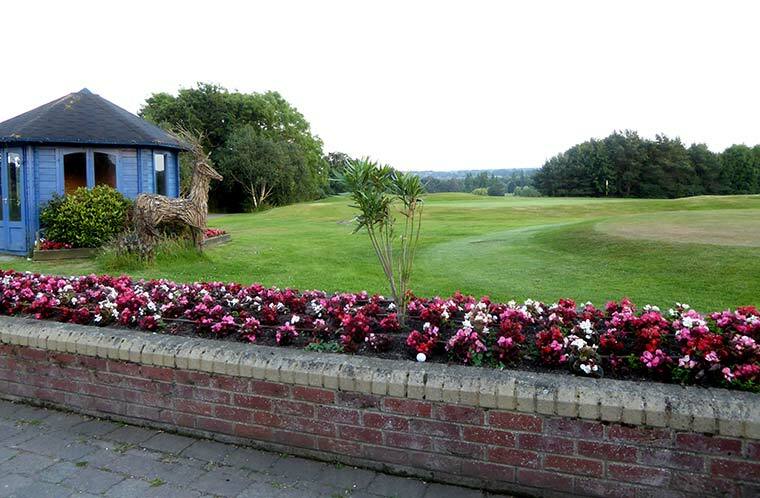 It’s an open plan bar and bistro, with golfers wandering in for a meal or drinks. There is a more formal restaurant called Bentleys upstairs to suit other moods or occasions, but Spikes was perfect for us on this extremely hot June day. There is also a large patio, which can be covered for shade or if a drop of rain threatens. Our waiter soon arrived to take our drinks order. Because it was a such a hot day, it was a pint of chilled Peroni for my husband and a small glass of chilled white wine for me – Louis Eschenaeur Sauvignon Blanc, which was very fruity and had a pleasing aftertaste. Something that particularly impressed me was that Spikes offers wine in three different-size glasses as well as by the bottle. The menu changes – whether for breakfast, lunch or dinner. Our dinner menu had a choice of ten starters, nine mains plus two specials, and three desserts. At this point I should mention that there are two different prices for food, one for members of the golf club and a slightly higher price for nonmembers. However, the difference is small, just a pound or so, and even so we thought the prices were very reasonable. For example, an 8oz Ribeye Steak with mushrooms, baby leaf salad and fries costs £12.95. You could pay a lot more elsewhere. However, steak wasn’t our choice for this occasion. 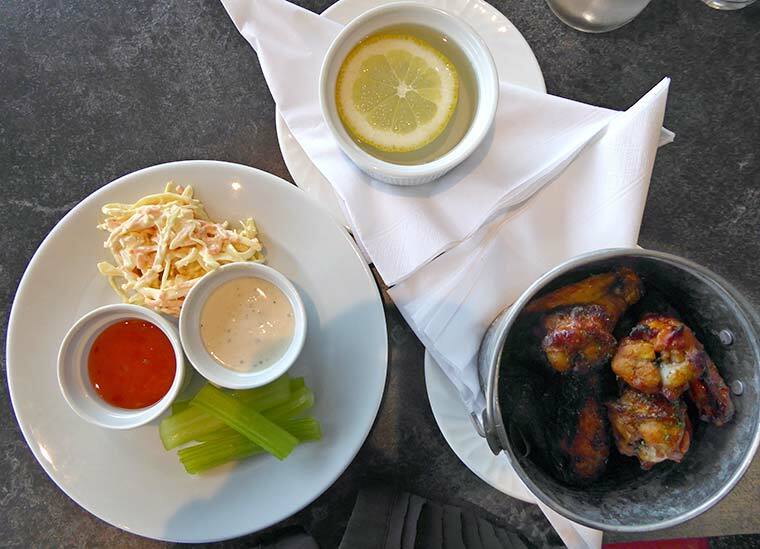 We chose baked avocado served with prawns and creamy sauce and sweet chilli chicken wings served with celery and dipping sauces as our starters. 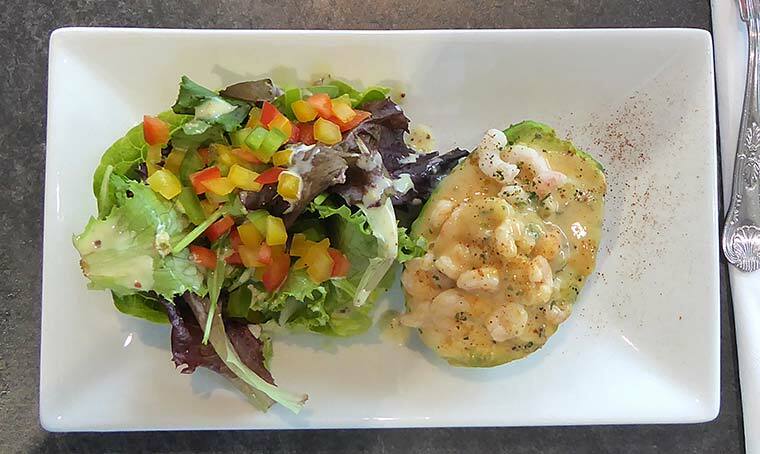 Paul enjoyed his avocado and prawns, which was presented with a pretty salad garnish. My chicken wings were served in a little bucket and were piping hot and delicious, if a little messy. The finger bowl supplied was really helpful. The sticks of celery were really fresh and crunchy and I particularly enjoyed the creamy homemade coleslaw. 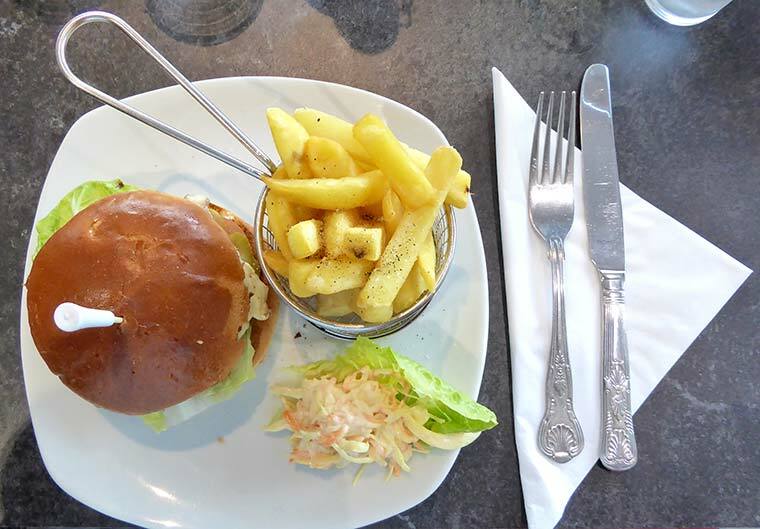 Our waiter whisked away our empty plates and our main courses soon arrived; Paul had gone for the homemade chargrilled Dudsbury burger in brioche bun with Cheddar cheese and fries, while I had selected salmon and broccoli fishcakes, salad and new potatoes from the specials board. 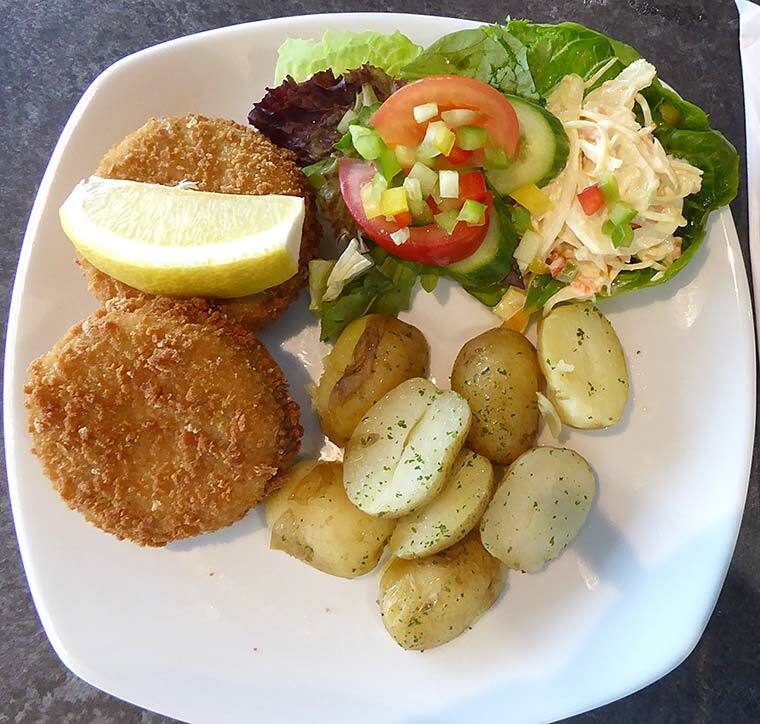 The homemade salmon fishcakes were really crunchy on the outside and had goodsized pieces of fish inside. They tasted as good as they looked and I definitely recommend them if they come up on the menu again. The salad was extremely fresh, not some limp leaves that you sometimes get offered in restaurants. Paul’s burger was of a high standard and was soon demolished. At this point during our meal something rather unusual happened. My husband spotted someone who looked very like an old friend of his from 30 years ago but who lives in a different part of the country. And yes, on enquiring it was him; he also mentioned he’d had a meal at Spikes Bistro the previous night and said it was very good. We still can’t get over the coincidence of seeing him there, though! Anyway, our attention reverted back to our meal and the serious business of choosing a dessert. We contemplated the ginger sponge and custard or the warm chocolate brownie and ice cream but the raspberry and white chocolate roulade won. It was served with a garnish of strawberries and raspberries and vanilla ice cream and we shared it between us. It was luscious. A cup of filter coffee rounded off our meal and we gazed out over the beautiful scene of the golf course’s first green and the grass and trees beyond. This is a wonderful spot to meet family and friends, whether for breakfast, a cup of coffee or drink, lunch or dinner. The bistro is open from 7am in the morning to late evening. It’s a roomy size and groups of up to 22 people can be accommodated on one table but you should book. You should also book, whatever the size of your party, at weekends to avoid disappointment. A carvery is available on Sundays. 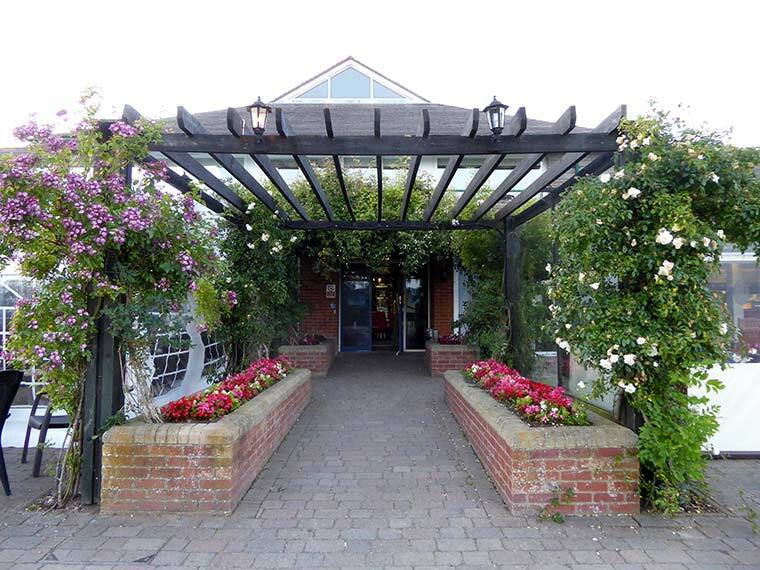 We found the waiting staff attentive and friendly without being unduly so, and the service quick, despite two large parties of people being there that evening. It’s another one to add to our list of good places to go to.